SoftPlanet makes it possible for everyone to get free HTC Sync download directly from our servers. There is no registration needed for downloading. As you may have already guessed, HTC Sync 3 is an application, dedicated to managing your HTC device content. You are able to synchronize your mobile device with your Outlook contacts and web browser bookmarks between your PC and your smartphone. Basically, this application enables you to explore and manage your HTC phone through your personal computer. As you know, it is not just enough to collect your greatest moments, you actually need to store them somewhere. Smartphone memory has dramatically increased in the past few years. However it is still not spacious enough to store all your awesome experiences. So you actually need to replace the old ones with new ones. In order to solve this issue, you need to transfer your data from your smartphone to your computer. The solution provided by HTC Corporation is called HTC Sync 3.3.63. It is compatible with almost each HTC smartphone model available. It is 100% free and it is designed to make the syncing process extremely easy. You are able to quickly synchronize your contacts, calendar events, bookmarks, documents, etc. Once you have all your HTC mobile device content on your PC, it is very easy to manage it. In order to keep everything safe, you can create a backup whenever you want. 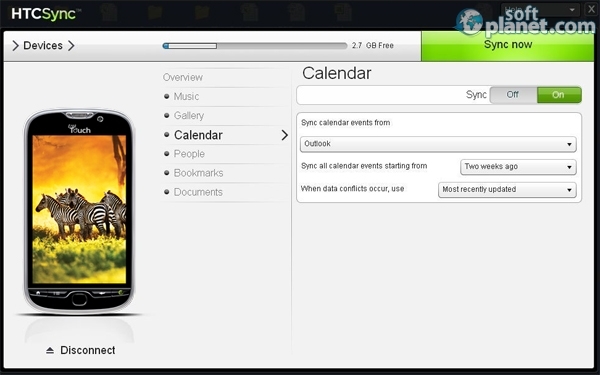 HTC Sync 3 is capable of managing all your multimedia content like photos, personal videos, etc. Sometimes there are some small changes to be done like rotating or cropping photos. This application supports such actions, so it is not necessary to use 3rd party software. You would probably ask “What if I use an iPhone and want to change it with an HTC device? How can I get all my data from one device to another?” These are very good questions actually. HTC Corporation has already found the answer. HTC Sync is capable of transferring all your iPhone content to any supported HTC handheld device. Like all HTC mobile devices, HTC Sync 3.3 comes with a great design as well. The developers, who have made it, have really done their best to keep it as close as possible to the KISS principle (“Keep it simple, stupid”). Its features are divided into different sections, so it is very easy to find what you are looking for. Basically, what you receive is a simple design and great user experience. I really think that it shows the best performance among all its competitors. The application is stable and works very smoothly. HTC Sync supports various languages as well - Burma (Windows only), Czech, Danish, French, German, Italian, Japanese, Norwegian, Polish, Portuguese, Russian, Simplified Chinese, Spanish, Swedish, Traditional Chinese, UK English and US English. HTC Sync 3.3.63 is an HTC device management software utility. It comes free of charge directly from the manufacturer. The application provides you with great abilities to manage your HTC device content, to protect it by creating a backup of it, etc. There is no argument that HTC Sync 3.3 is the software for handling your HTC handheld device. Our security scan shows that HTC Sync is clean from viruses. The current version of HTC Sync has been scanned by our system, which contains 46 different anti-virus algorithms. That ensures that HTC Sync 3.3.63 is 100% safe for your computer.